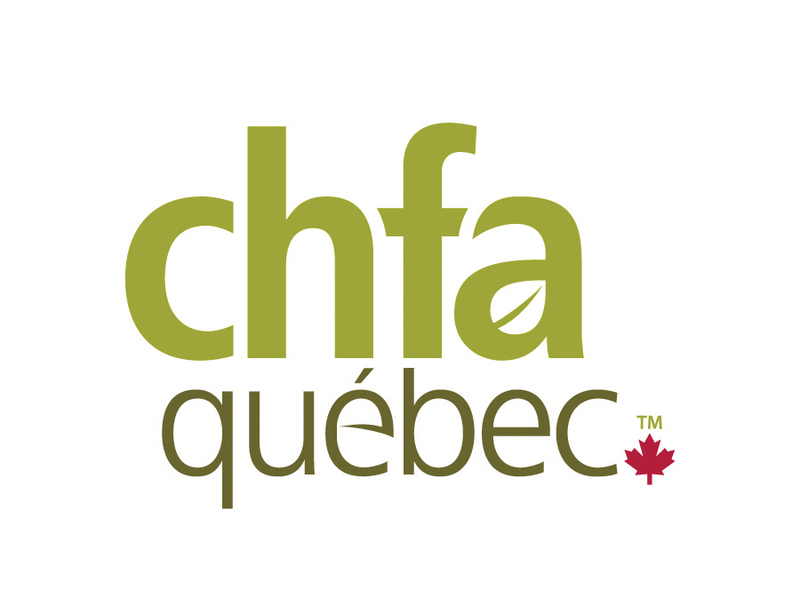 CHFA Quebec returns to the Palais des congrès de Montréal in the spring. Retailers: Terry’s Tools & Tips is designed to help you combine passion for health with healthy profits. As a health food retailer, you’re already passionate about helping people live their best. What if your mission could generate even more success for your store? Terry Naturally CANADA says it can, and Terry’s Tools & Tips from Terry Naturally CANADA can show you how. Vancouver is well known for its outstanding health food stores. If you’re coming to CHFA West, join us for a tour of five must-see stores on Thursday, February 21, 2019 from 9AM to 5PM. From traditional health food stores to larger super centres, we’ll take you on a tour that highlights their unique offerings and share successes that could easily translate to your location. Join host Bruce Cole of CNHR Magazine for a full day of exploring, learning and camaraderie. 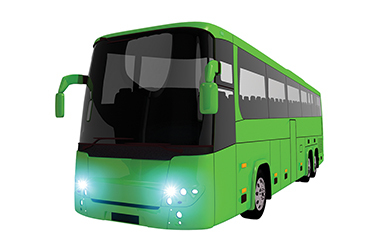 Departing from the Vancouver Convention Centre, West Building, the Retail Bus Tour is a great opportunity to network with fellow retailers as you begin your CHFA West experience. Registration fee includes lunch. $40 for members, $50 for non-members. The 18th annual Health & Wellness Fair, ­– hosted in September by Health Experts Canada and The Apple Market – continues to be a popular and fun natural health event. The newest Avril Supermarché Santé has taken “going green” to a whole new level. The giant Quebec-based natural health retailer opened its newest – and largest – location on June 6 in Laval, QC. One of the most amazing features of this 44,000 sq. ft. store is an indoor farm. The CultiGo automated vertical farming platform is a technology developed in Quebec by Inno-3B and it will allow Avril Laval to grow organic microgreens on-site year-round. Revolutionary and ecological, this farming technique reduces greenhouse gas emissions, eliminates pesticides and encourages local farming for incomparable freshness. Several varieties and blends of microgreens will be grown at the Laval store, and then be distributed to Avril’s other stores. Avril is the first retailer to use the CultiGo platform. The Laval location – which the company says via press release is the largest health food store in Quebec – represents a $10M investment for Avril, which was founded in 1995 by Sylvie Senay and Rolland Tanguay. The opening of this new store has created 200 new jobs, bringing the total number of employees to nearly 1,000, working at one of the stores, at the logistics and distribution center or at the head office in Granby. Adapting to its customer’s needs and lifestyle, Avril Laval offers even more choice, based on three main principles: flavour, freshness and simplicity. Customers can now purchase fresh fish, homemade pizza, organic roasted chicken, bread and pastries, gelatos and grab-and-go meals. The gelatos are prepared in the traditional Italian style. The pizzas are made from the finest organic ingredients, including San Marzano tomatoes, and are baked on stone in a state-of-the-art oven. The fish comes from sustainable fishing practices and most are Ocean Wise certified. The new store has a 130-seat food court and a 48-seat terrace. Two menus are offered: one bistro-style and a vegan alternative. Avril Laval has a large natural cosmetics department, designed to display iconic natural and organic cosmetic brands from here and abroad. Customers can also benefit from personalized recommendations from beauty advisors and receive skin care treatments in private treatment rooms. “The opening of our eighth store in Laval is another step towards achieving our ultimate mission of making natural and organic products accessible to all,” says Sylvie. 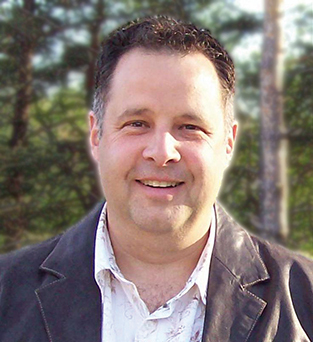 CNHR is welcoming back one of its original (and most popular) business writers, Alain Roy. Alain brings a great deal of industry experience, having worked in all facets of our industry over the years, including retail, distribution, manufacturing and consulting. Currently, he is president of Veeva and Natural Business Partners. Alain will be focusing his efforts into a series of continuing articles on the benefits of strong partnerships between retailers and suppliers. He will be asking industry leaders to share their greatest partnership success stories. “During my career, I have seen and been part of different partnership attitudes. Like personal relationships, working in true partnership means understanding each other’s needs. This new series will focus on understanding the needs of vendors and retailers alike, so we can all continue thriving.” Alain’s first article will appear in the September-October issue. Welcome back, Alain! 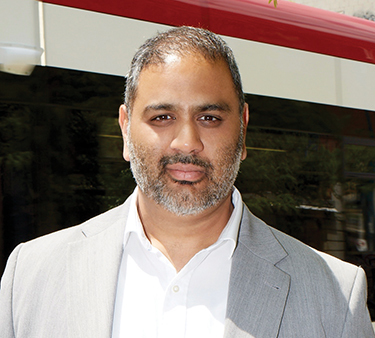 Raji Kalra has co-founded a new company called Peopletail. Its purpose is to make it easy for people to include their own links to e-commerce retailers in their articles, photos and videos - making their content into shoppable recommendations for other consumers to buy through. “The user-generated content from everyday people will help increase traffic to e-commerce stores of health food retailers,” explained Raji. After an impressive 41 years in natural health retail, Don Smith and his wife Claire are moving on. They have sold their 6,500 sq. foot store - Foodsmiths - in Perth ON and are putting their retailing days behind them. Since 1991, the Canadian Women’s Foundation (CWF) has funded programs that work to change the lives of women and girls in more than 1,500 communities across Canada. The CWF is one of the ten largest women’s foundations in the world. This year in particular, women and girls are raising their voices against abuse and for fair and equal treatment. 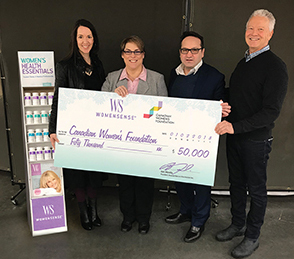 In its seventh year supporting the CWF, WomenSense – along with Assured Natural Distribution – has announced its spring 2018 campaign. The funds raised through this campaign contribute to ground-breaking programs and services for women and girls in your local areas, creating safer families, stronger communitie, and a more prosperous society for all. When retailers participate in the spring campaign by recommending WomenSense products throughout the year, you are helping to empower women and girls to move out of violence, out of poverty and into confidence and leadership. The Guelph Organic Conference continues to focus on Canada's rapid organic sector growth. “The show was great with lots of new energy,” said conference manager Tomas Nimmo, in reference to the event which took place Jan 25-28. “We had plenty of new exhibitors join our regulars. The conference is also known as a hub for organic sector networking. "It's the place where many future organic marketing projects get their start and then take flight in the following months," Tomas added. As interest in organics continues to increase, the conference saw workshop attendance grow and strong interest in the trade show. Taslim and Hanif Jamal – the owners of Toronto’s The Wholesome Market – just celebrated 20 years of working with Community Builders Youth Leadership. This not-for-profit organization was founded in 1994 by a committed group of educators with extensive experience in teaching, counselling, and working through the arts with children. Community Builders’ mission and passion is to help create inclusive school communities by developing the leadership capacity of young people and adults. They train elementary students, teachers and parents in anti-bullying, social inclusion, equity and conflict resolution, while raising their awareness of racism, sexism, classism and other forms of oppression. The Wholesome Market donates $2,000 annually to the group and is planning something big in May: a community event based at the store with the goal of raising awareness of the important issues Community Builders addresses, and $5,000 in donations to support this work. The funds will go toward the recruiting and training of volunteers, as well as additional staff. This will enable the organization to go into more school communities to teach students and raise awareness of the issues. For more information, visit cbyouthleadership.org or contact Hanif at 647/500-3474 or hanif647@yahoo.ca. 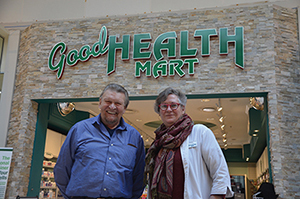 The Good Health Mart group of stores celebrates its 25th anniversary July 1. It was 1993 when Eunice and Murray McMahon bought a health food store in Woodbridge, ON. Within two years, they built a second store in Belleville, ON and by the next year, they were franchising their concept. Through franchising and acquiring existing stores, GHM grew to a 12-store organization. “Some of our staff and franchisees have been with us for over 20 years,” said Murray. “Many more have been with us for over five years and counting. 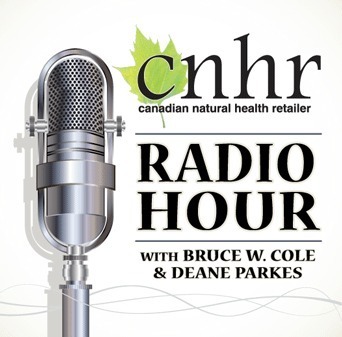 We give heartfelt thanks to our loyal staff and customers and long-time suppliers who have been on this journey with us.” CNHR will be featuring Good Health Mart in the next issue. 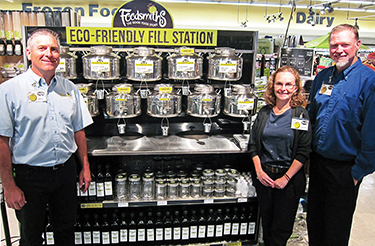 Foodsmiths – the “good food store” in Perth, ON. – raised $2,255.75 in November for the Perth Royal Canadian Legion with its third annual Poppy Project. The Poppy Project, which is based on the sale of hand-knit poppies, was introduced by Foodsmiths co-owner Claire Smith after seeing an appeal for fundraising ideas put out by the Perth Legion. "It was based on the successful British Legion hand-knit poppy project." says Claire. "I asked our cashier and enthusiastic knitter Linda Anderson to tweak the pattern. She did, and our poppy project was born." Foodsmiths supplies all materials to a core of volunteer knitters, including staff and customers of Foodsmiths. Since starting the project three years ago, Foodsmiths has raised $8,798.45. One hundred per cent of all proceeds are donated to the Perth Royal Canadian Legion. It’s been a busy holiday season. Now that you’ve taken a moment to enjoy reading the latest issue of CNHR, please also take a few minutes to visit chfa.ca/west for the most up-to-date information on this year’s CHFA West. The show is being held at the Vancouver Convention Centre on February 22 to 25 and there’s no question the event will live up to its theme, Connecting the Industry. What can retailers expect? We’ve created even more opportunities for you to network both on and off the trade show floor. And, we’ve developed one of the most comprehensive conference programs to-date. One of the sessions that will be of interest is titled Death by Amazon. It’s a jarring headline that was published in the Financial Post. The article led with “Amazon.com Inc.’s purchase of Whole Foods Market Inc. last month has pushed an already nervous retail sector into a collective panic not seen since the great recession.” But the real headline according to Bruce Winder should be “how retailers can withstand the onslaught.” Bruce (co-founder and partner at the Retail Advisors Network), is often interviewed by leading TV media outlets such as BNN, CBC, CTV News, CP24, Global News and has contributed to the Globe & Mail, the Financial Post, The Toronto Star, Reuters, Bloomberg, Adweek, The Calgary Herald and the Ottawa Citizen just to name a few. We’re excited to be able to bring his expertise to the program. Two in three Canadians (66 per cent) are spending at least some of their weekly grocery budget on organic items, up a staggering 10 points from 56 per cent in 2016. This is according to a September 2017 report from the Canada Organic Trade Association. And with that increased spending comes the challenge of staying on top of research and trends related to organics. At The Big Carrot, a number of different initiatives are undertaken to prepare staff for these conversations. 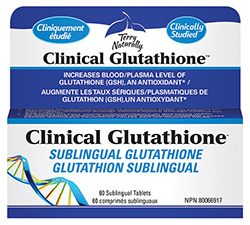 A team of nutritionists provide customer service. Staff play active roles in industry organizations such as the Canada Organic Trade Association, CBAN, the Non-GMO Project, and the Organic Council of Ontario. Initiatives such as Nature’s Finest Fund and Retail Organic Certification are a priority. All of these activities ensure staff training, constant learning and knowledge transfer are a priority at The Big Carrot. 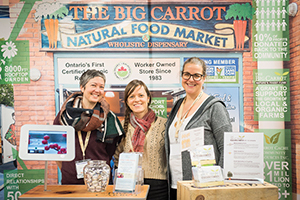 As part of their industry involvement priorities, The Big Carrot will once again play a key role in the Guelph Organic Conference. A Platinum Patron of the event, The Big Carrot will be exhibiting, and Kate will present “Current & Relevant Organic Research” – a free workshop on Sunday, January 28. 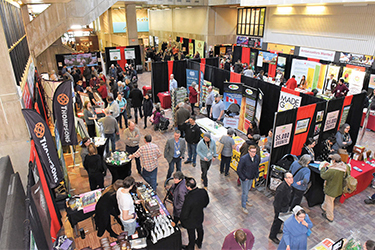 The free trade show Jan 27 and 28 will showcase over 150 exhibitors, including Pfenning’s Organic Farm, Booch Organic Kombucha, GoBio and Harmony Organic Dairy. Many exhibitors will be offering samples to attendees. To learn more about the Guelph Organic Conference (Jan 25 to 28), visit www.guelphorganicconf.ca. After 27 years of pioneering good health, Organika is introducing a new re-brand initiative. The new tagline and new purpose – “Your Natural Solution” – more thoughtfully and effectively combines Organika’s core focus on contributing natural solutions to you and your customer’s good health. Organika will be launching this exciting re-brand initiative in 2018. In June of 2017, Purity Life Health Products LP hosted its first beauty summit. The result was a very positive and educational gathering of some of the company’s most valued business partners, including 38 natural health retailers. In total, 71 people took part, including staff, vendors and speakers. Nature’s Emporium’s new store in Appleby Common, Burlington, ON was formally opened with an illustrious gathering of local dignitaries and senior store staff.